Can You Scuba Dive After Suffering From a Collapsed Lung? Scuba Diver Medical Q&A: Can You Scuba Dive After Suffering From a Collapsed Lung? Q: Over 22 years ago, when I was 19, I had a spontaneous bilateral pneumothorax. This was not related to any illness or defect, it was something that can just happen apparently. The knowledge at the time was limited, but they thought that it was more likely to happen to someone of my age, height (tall) and build (slim), or maybe something to do with the shape of the chest cavity, but there was nothing concrete as to why it occurred. I had open chest surgery at Harefield Hospital to pop the bullae blisters from around my lungs which had burst to cause the pneumothorax in the first place. My lungs were ‘scrubbed’ and ‘glued’ to my inner chest wall to prevent them collapsing again, although the consultants at the time said that it was unlikely it would recur. Now 22 years on, I am fine, healthy, physically fit and have had no impairment of lung function or lung capacity at all. At the time, the consultant said I could do anything except scuba diving because of the pressure, which was fine as it wasn’t something I was ever interested in doing. In recent years it has started to appeal to me more and more and something I know my daughter would love to do when she’s old enough. However, I have resigned myself to never being able to dive, but just snorkel, which is not quite the same. Is the medical thinking still the same on this now as it was then? Is there any way around this or is scuba diving still strictly off limits for me going forwards? A: Firstly, a word or two about collapsed lung, or ‘pneumothorax’. The lungs normally sit happily in the chest cavity, like balloons, with a negative pressure keeping them from collapsing. If the lung surface is damaged, then the air within can leak out into the chest cavity. As the air accumulates, the increasing pressure crushes the lung down, until eventually it collapses – a pneumothorax. These are generally split into two types, spontaneous (out of the blue) and traumatic (due to an injury of some sort). Spontaneous ones can occur in young people, skinny tall male smokers being particularly prone, or in older individuals with underlying lung disease (again most common in heavy smokers). Sometimes even a hiccup is enough to rupture a wee portion and allow air to escape. Traumatic ones are usually due to an injury (accidental or planned), which can leave scars on the lung. Interestingly, before anti-tuberculous drugs were discovered, doctors used to puncture the lungs of tuberculous patients deliberately, in an effort to collapse a lobe, or entire lung, around a cavitating lesion. This was bizarrely known as ‘resting the lung’ – a more inappropriate descriptive term for a medical procedure I have yet to discover. And so to diving. Both types of pneumothorax can predispose you to air trapping, with consequent over-expansion injury when you ascend from a dive. However, in your case, the incident is 22 years in the past, and it sounds as though you’ve had the correct procedure performed to prevent recurrence (pleurodesis, or the ‘scrub’ and ‘glue’ as you so eloquently put it). Thus it is very unlikely to cause a problem, but a high-resolution CT scan of the lungs may be needed to be 100 percent certain. Spirometry (that blowing into a toilet roll tube test) would also be required to get an idea of the capacity and elasticity of the lungs. So pop down to your local dive doctor and get the tests done for full peace of mind. If they’re okay, then dive on with your daughter. Do you have a question for Dr Firth? Email [email protected] com with your query. Dr Oliver Firth has gained considerable experience in the field of diving and hyperbaric medicine since joining LDC in 2006. He is an Approved Medicial Examiner of Divers for the UK HSE, and a medicial referee for the UK Sport Diving Medical Committee. He is involved in the management of all types of diving-related illness, including recompression treatment, as well as providing hyperbaric oxygen therapy for non-diving conditions. He remains a passionate diver and has participated in various expeditions and conservation projects throughout the globe. Scuba Diver Medical Q&A: Can yoga help with gas consumption? And can you have an allergic reaction to the cold? Scuba Diver Medical Q&A: Is it safe to scuba dive if you suffer from ME? 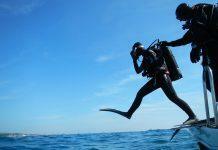 Scuba Diver Medical Q&A: Can you dive after using Sudafed?